Rotator Cuff's and Bursitis… what now? Rotator Cuff’s and Bursitis… what now? Do you have a sore shoulder? Don’t despair, you are not alone! It can be quite common to have a sore or stiff shoulder at some point in your life, even without an injury. Often people will go and visit their GP after the onset of shoulder pain. This would often result in a referral for medical imaging. What happens when the scan shows you have a torn rotator cuff and a substantially thickened bursa? This sounds horrible, I agree, but I am going to explain to you why it is most likely all going to be ok. The shoulder is a shallow ball and socket type joint which means it isn’t held in very well by the bones and ligaments and relies heavily on muscles to support it (compared to something like your hip joint). This has some advantages including it can be very flexible and move in lots of directions and some disadvantages such as it can be harder to control and prolong recovery because it is harder to rehabilitate on your own. 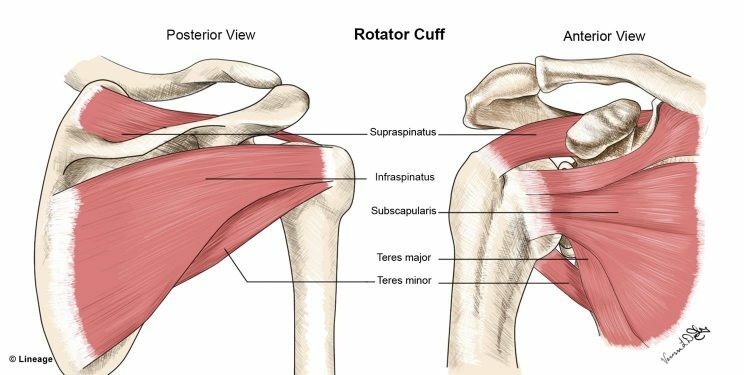 The Rotator Cuff is a group of four muscles that surrounds the shoulder and helps with stability of the shoulder and movements in all directions. It is labelled a ‘cuff’ because the tendons of all four muscles mesh together and encapsulate the shoulder in a flat blanket like structure. Sounds cosy right! Because the four tendons of the rotator cuff are actually more like one big blended one, it is very hard to isolate one muscle of the rotator cuff. So, in reality instead of four different muscles, we have one big blanket of tendon that can use a variety of forces to achieve the movement we want. Your bursa is a fluid-filled sac that helps to reduce friction in your shoulder spaces – it allows muscles and tendons to slide and glide freely. You have several bursae within your shoulder (and lots of other parts of your body) (1). As we use our arms for lots of tasks over the day – some thickening is normal think about it like callouses on your hands! Bursitis and rotator cuff pathology can often go hand in hand due to the nature of the shoulder joint. Shoulders can be easy to stir and difficult to settle which can make it frustrating when the pain has been there for a long time. How can a tear be normal? As we age it is normal for certain parts of our body to become ‘worn’. This is well documented in most body parts with the shoulder being no exception. In 147/664 subjects (22.1%) had full-thickness rotator cuff tears in the general population (2). Symptomaticrotator cuff tears accounted for 34.7% of all tears and asymptomatictears for 65.3%. This means 2 out of the 3 people with a tear – had no pain or awareness that the tear even existed! (2). I understand tears and or bursitis can be normal, but mine still hurts so what next….? 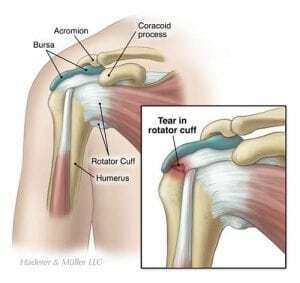 If a rotator cuff tear is causing a severe lack of strength which is causing you to be restricted in day to day actions regardless of pain then you will need a thorough assessment by a knowledgeable health professional to determine what management strategies you should employ and how you can get back to doing what you love. 1. Detection of subacromial bursa thickening by sonography in shoulder impingement syndrome. Tsai YH1, Huang TJ, Hsu WH, Huang KC, Li YY, Peng KT, Hsu RW. Chang Gung Med J. 2007 Mar-Apr;30(2):135-41. How Can Pilates Ease Rheumatoid Arthritis & Osteoarthritis? Our experienced Physiotherapists treat: back, knee and neck pain, joint replacements, sports injuries and much more! You may be able to claim on Private Health - please bring your health care card.